1993 Toodyay Songwriting Award WA. 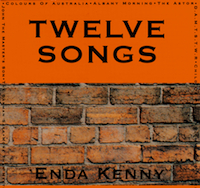 "Enda Kenny's Twelve Songs was the best Australian record of 1994. Kenny writes and sings the stories of today's Australians and fits these wonderful songs to equally wonderful melodies and arrangements" The Melburnian August 1996. "Everything contemporary folk music should be" Folk On Tap UK "A trawl of gems of observation seen through the eyes of a transplanted Dubliner creating his own legend in Australia...get on his train now" John O'Regan, Rock 'N Reel.